1. Can, freeze and dehydrate all year. Put up foods like berries and summery fruits and veggies throughout the year instead of buying them out of season. This way you can still cook with local foods even in the dead of winter. Save money by patronizing you-pick farms for berries and vegetables in the summer; apples, pears and pumpkins in the fall. Whether your centerpiece is a turkey, ham, roast or goose, make sure your meat is grass-fed, pastured, hormone-free and organic. (Same goes for dairy.) Or, go even further and serve venison, boar or other wild game that you’ve hunted yourself. You can’t get more free-range than that. No backyard? No problem. You can start worm composting right in your kitchen, closet, pantry or basement. Come spring, you’ll have rich soil to start your seedlings. Bottled water is just plain wasteful and has no proven health benefits whatsoever. Invest in a filtered pitcher and a reusable BPA-free water bottle instead. Whenever possible, buy local. This helps reduce greenhouse gasses created by transporting food long distances. 6. Reuse your cooking water. Boiling veggies or pasta? Don’t throw out the water—it’s filled with flavor. Instead, reuse it in couscous, rice or soups. 7. Invest in good cookware. Remember those coated non-stick pans your mom loved in the 90s? Yeh, they’re horrible for you. Choose stainless steel, ceramic or cast iron instead. 8. Replace refined sugar with honey. Use honey instead of table sugar in recipes—it’s more sustainable and has tons of health benefits. Local honey? Even better, and may help with your allergies. When it comes to products such as tea, coffee and chocolate, buy only fair trade. You’ll be promoting better conditions for workers and more sustainable growing methods. 10. Use organic olive oil. Conventional olives are heavily sprayed with pesticides, which can be even more pronounced when pressed into oil. Spring for the good stuff. 11. Give plastic the boot. As we learn more about the health and environmental effects of plastics, this is the perfect time to phase them out of your kitchen. Opt for wood or glass bowls and storage containers instead. Check the clearance section at your local supermarket for deeply-discounted bread, produce and items that are nearing their expiration date. This is another great way to build up your frozen food stash. Take advantage of the foraging trend and hunt your own wild herbs, nuts, greens, mushrooms, nettles and edible flowers. You can even fashion your own table arrangements from pine cones, branches, holly, greenery, branches and whatever else you can find in the woods. 14. Give vegan “dairy” products a try. We know, we know: vegan cheese just ain’t the same—but hear us out on this one. You can easily replace things like butter and mayonnaise with healthier, vegan versions without anyone (including yourself) noticing. We hear a lot about organic, free-range meats, but the truth is, factory-farmed dairy animals are kept in the same abhorrent conditions. Every little bit helps. 15. Get creative with leftovers. Move over turkey sandwiches, these turkey spring rolls with cranberry sauce are a much tastier way to use up that leftover bird. Purchase items such as beans, lentils, quinoa and rice in bulk. It’s considerably cheaper, and who needs all that extra packaging, anyway? No more excuses: if you have a windowsill, you can grow food. 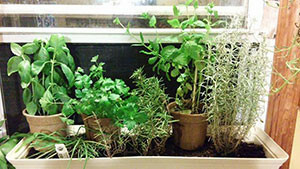 Plant herbs, garlic and other small veggies in cups or container gardens, which you can keep inside all year. Just water them along with your houseplants. According to Use Less Stuff, the United States generates an additional 25 million tons of waste from Thanksgiving to New Years. Recycle what you can. Unfortunately, most wrapping paper is not recyclable, so opt for newspaper, reusable bags, tins and ribbons, fabric scraps or other creative coverings for your gifts. Mother Earth will thank you.